Select File Open File from the main menu. The dialog box in Figure 2.1 appears. Note:Clicking Go to Personal Files directory navigates to your personal files directory. By default, the personal files directory corresponds to the Windows directory shown in Table 2.1. 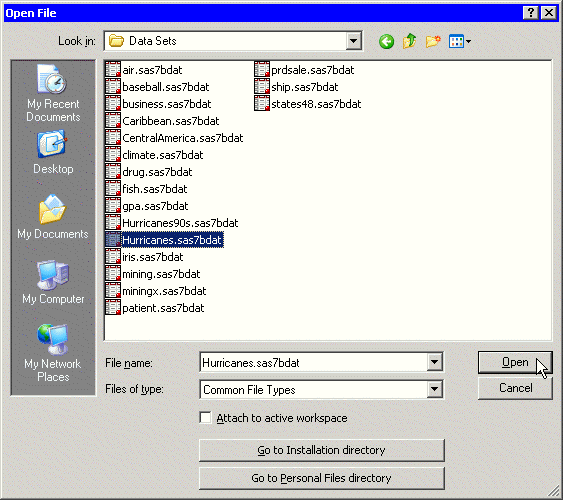 Select File Open Server Data Set from the main menu. The dialog box in Figure 2.2 appears. Note:Figure 2.2 shows librefs that are not predefined. If your PC is your SAS server, you can create an AutoExec.sas file in the C:\ root directory that contains LIBNAME statements that define librefs on your PC. 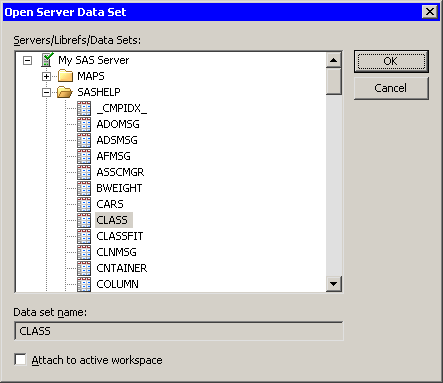 Everytime a SAS server starts, the SAS System executes the AutoExec.sas file automatically. If you are running a SAS server on another computer, ask your site administrator to set up librefs for you.